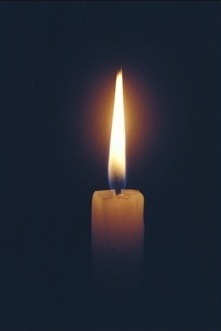 Finding the kindling - the wick - keeping the flame alight. Believing in it. This is more of a tweet than a post, and it is again after midnight. There are too many things to get done in the few hours where doing is possible. But it seemed important to let you know that I no longer want the Sarah Lund sweater. Call me fickle, but I am now properly in love with a pair of rainbow woollen slipper socks and fingerless gloves - handmade by a friend who lives (and this is the honest truth) in an igloo without any of the mod cons that we all take for granted. I received them yesterday in the post, since when I have not taken them off. And I have stopped thinking about the sweater. Someone sent me a tip-off that they were selling replicas in H & M but actually, on investigation it seems that the star and snowflake motif is in every shop one looks at. Everyone wants a piece of Sarah Lund's jumper. It would obviously be terrible for my reputation if I were to be seen following the common herd, so back I go to the trusty purples shell-suit trousers. And the other thing I wanted to say is: how is it possible that every tumbler in the house has disappeared? I simply accept that this happens with ballpoint pens and socks. But this is too much. I am drinking water from a mug. Something very weird is going on. I can't sleep and have got it into my addled brain that all I really want for Christmas is this original Sarah Lund sweater. Actually, I have got it into my addled brain that if I could only have this sweater then everything might suddenly come right. I have felt this before - when I was about nine years old, I think. Then it was a talking doll that I wanted. It had a string that you pulled at the back and it said things like, my name is Little Poppet and it cost five pounds, nineteen shillings and sixpence - a fortune. Just as well I didn't get it, the let-down would have been dreadful and I would have been stuck with her. I want this sweater bad. Why? I enjoyed The Killing, but not nearly as much as most people seem to, and I don't really want to be the Sarah Lund character. I am not even sure that the sweater would be right for my shape. I still want it. I have trousers and a jacket that would go perfectly with it. I would wear it as it is supposed to be worn - all the time - because that comes naturally. When I have something I like I tend to bond with it (e.g. purple trousers) and see no reason to ring the changes. 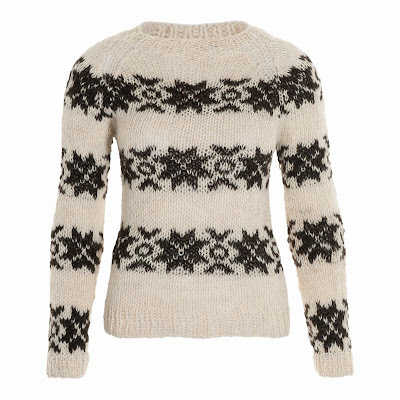 It is made of good, Faroese, breathable wool. It costs 280 euros - 320 with postage and packing - and is therefore out of the question. Knitting it myself is also out of the question. But I keep looking at it. The wool is just right. The funny star pattern also. Right for what, though? What ridiculous thing do you really want for Christmas? I was just about to share with you a fulsome complaint about the state of the Signs barnet (I am having a bad hair month) when I was struck by a profound thought. Bear with me, as they teach them to say at call centres, especially when it looks as though there may be trouble ahead and no possibility of resolution (our fridge light is not working, it has been kaput for several months, we have a British Gas kitchen appliance service agreement that should deal with this, they are apparently working 'night and day' to resolve etc etc). There is much that I could be complaining about. The state of my fake Ugg boots, fact of the heel being conspicuously worn when I hardly, I mean to say, really walk any length to brag about; I have put on weight and it isn't even Christmas yet; it is cold in the Signs bedroom because the loft has never been properly lagged and we just can't - etc; and so on, including the hair and the fridge light, as outlined above. The profound thought that barged into my consciousness is this: complaining is really a luxury activity. Don't get me wrong - I am all for complaining often and loudly, especially about poorly-administered service agreements. My 'musn't grumble' stance is ironic, not from the heart or from any conviction that there is merit in keeping stumm about the variety of aggravation that life throws at you. But complaining, if you are going to do it properly, takes energy, life forces, sure ground beneath your feet of the sort that stems from a feeling that all is fundamentally well, were it not for the malfunctioning fridge light (the sound on my computer has gone mute btw, and there is a crack in our recently-acquired toilet seat, just so you know). Consider this: when you are in your mid-thirties you complain about the fact of getting older. You crack on about how you are now, technically, middle-aged, you don't stay up all night drinking as you did in your teens and twenties and you can't so easily ignore the bronchial cough from all the cigarettes you smoke. In your mid-forties you are much less loud about all this. You paint over the grey bits and generally stop drawing attention to age-related matters especially as some of them might have become embarassing. In your mid-fifties you either kind of shut up about it or you say something properly interesting, or write poety. You understand in your soul that we are mortal and memento mori becomes a mantra worth considering. It is all too close to the bone for mere complaint. When life becomes properly hard, with fear, pain, illness or hunger as constant presences, things go quiet, or something quite different happens. I do not think you will easily find someone with M.E. complaining about what the disease has done, is doing, to their lives. You disagree, perhaps - think that there is an endless stream of complaint from the M.E/CFS community, enough to make you want to switch off, but what you see does not touch on the heart of the matter. I have said this before and will say it again: there are people living the severe version of the condition you have heard referred to as Myalgic Encephalomyelitis and what they endure is unspeakable and heroic. Some, with difficulty and extraordinary tenacity, manage to write about it, speak the truth. When they do, the words are song-like. They give utterance to something mysterious: how we can be in seemingly impossible conditions, maligned and forsaken, and yet bear witness. Lament is the purest form of song I know. Greetings to y'all this newly starlit Advent - and to you, the singers: I listen, I hear, I lend my voice. Labels: advent, how it is, light and darkness, m.e. I like the sea in all its aspects. Yesterday the surface of it was wind-prickled, unsettled, a hard metallic shining in slow motion, a severity of grey along the curve of the horizon. I have always thought: if you look at something for long enough you do, to some extent, become it for a space. I wanted not to be this human thing stranded on dry land with my two thin legs, the laces of my Doc Martens all unravelling on the rough stones by the mouth of the river that comes and comes to the father/lover rush of sea. I was jealous - landlocked in unsuitable footwear, I wanted to be seagull. There is something hidden in deep sea that even the sky can't read. It is said that the moon has power over sea, but I don't believe it. I wrote: I could have been stone at the bottom of your bed, moved from this place to that, grey flint with a hole in my heart, a grain of sand - something, or almost nothing. This yearning on the shore by white cliffs is the farthest I can go - the closest I can get.